Keeping you connected to your farm. We’re passionate about keeping you connected to your business. That’s why we build the most advanced tools to monitor your grain and fuel storage, so you can worry less, be more efficient, and spend more time doing what you love. Visit us at the Saskatchewan Oil & Gas Show! With our partners at North Star Systems we’ll be showcasing our award-winning product- Fuel Lock™. 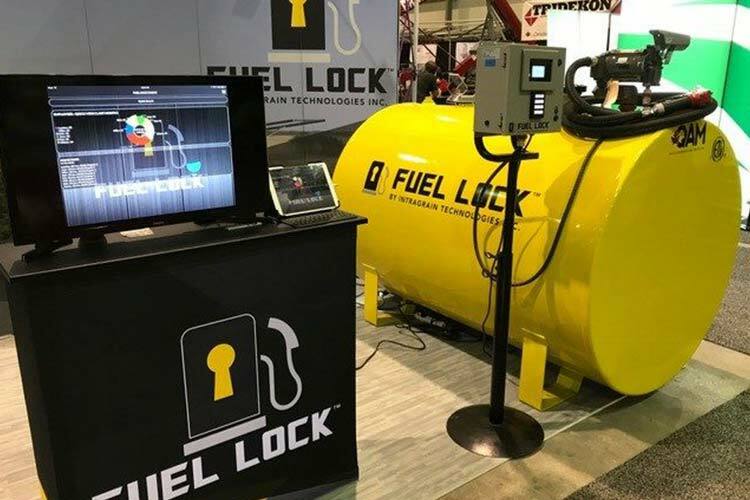 Visit our booth to learn how you can manage your fuel storage, all from the palm of your hand! We decided that we don’t want to take anymore more risk in the future. We want to insure our crop when it is in the bin, just like we insure our crop when it is the growing season so we decided to install the sensors. We were looking for a system to monitor our larger bins as any heating and subsequent quality loss would be devastating. I wanted a system that was easy to monitor and one that didn’t require me to physically walk to each bin. BIN-SENSE® LIVE did this and more, especially with the text alerts. The system was easy to install, and the yearly operating costs are very economical. I also like the fact that the system is easy to expand if we wish to monitor more bins. IntraGrain’s BIN-SENSE® LIVE wireless grain monitoring system is the ‘Lexus’ of grain monitoring systems. Not only is the installation quick, but the actual monitoring of the grain in storage could not be any easier. From the comfort and CONVENIENCE of our home computer or cell phone, grain temps on any given bin are instantly accessed. We can check every day, or set our notification perimeters and relax, knowing that we will be automatically notified if a problem is brewing. But that’s only part of why we are so pleased with this Saskatchewan engineered product. CUSTOMER SERVICE is another major factor. The few questions/issues we came across were handled within a day, and some even in hours! Kyle Folk and his team will definitely be getting more of our business. After suffering financial loss from grain spoilage, our farm invested in BIN-SENSE® LIVE. Within the first month of having our system up and running, BIN-SENSE® caught a canola bin that had a hot spot right in the middle, which we couldn’t have caught using an old thermometer. Simply put, BIN-SENSE® has saved our farm money and we expect this trend to continue. We are very enthusiastic about IntraGrain Technologies and share our yard site on their website with everyone who is interested. We feel they provide a very marketable product and extremely good value for our dollar. We have already saved one bin of wheat and another of canola using BIN-SENSE® LIVE; without it we would have had loss because we wouldn’t have been aware of any problems. We recommend this product to everyone we talk to. We have no doubt that BIN-SENSE® LIVE will add value to any business that stores grain.